SoundCloud is a great place for artists, musicians, and DJs to share their music, get feedback, and gain recognition in the industry. In fact, artists upload 12 hours worth of new audio every 60 seconds on the platform. With that amount of competition, growing your fan base here can be a challenge. To help you break through and build your following on the site, we have created this guide. Check out the top seven ways that you can attract more followers on SoundCloud. 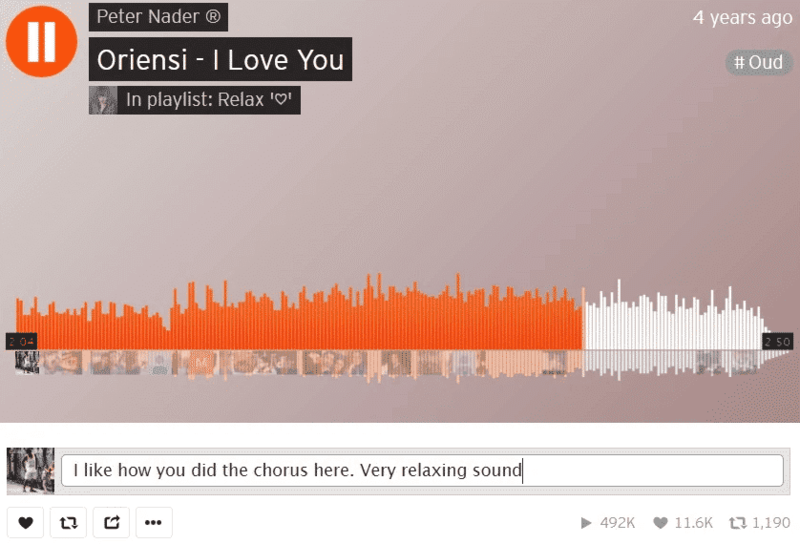 Listening to other SoundCloud users’ tracks is a good starting step towards building a relationship with them. When they notice a frequent listener, these creators will become more interested in checking out their tracks and consider whether they want to follow them, or even share them with their own followers. Make this effective by doing it without the obvious intent of attracting followers. Take advantage of SoundCloud’s search tools to find the tracks that are genuinely interesting and related to the SoundCloud account being promoted. This gives everyone involved greater incentive to participate. If you love the tracks that you are listening to, let the creators know. Liking or reposting their tracks will give them a chance to notice you and start engaging. Leaving comments on their tracks draws attention from the artists themselves, as well their followers. Take this a step further by providing your honest opinion about the track in the comments section. Feel free to write longer comments that better detail your insights. The track creator will appreciate your effort and more likely respond. This will also trigger a deeper conversation between you and other listeners. Using high-quality follower providers will make this strategy effective. Look into the quality of services that each provider offers. What you want are followers that have complete user profiles which are active. These better sell the image of your SoundCloud page as a popular one. Check out our list of providers to find out which ones have the best combination of quality service and affordable prices. Responding to the likes and comments that you get on your tracks is always effective for turning listeners into followers. The faster you respond, the more likely that you impress them and show that you care. Try responding within a few hours after you get a like or comment. This way, the person who liked or commented on your track will still recall it and respond back. While a short ‘Thank You!’ often works well to show your appreciation, you can take this as an opportunity to start a conversation with your listeners. Encourage them to ask you questions and respond to them accordingly. As we read above, reply as quickly as you can to keep them interested so that they have more chances to push the ‘Follow’ button. You can also use this opportunity to lead people to your other tracks. Make that lead-in a part of the conversation to better get them to listen. Encourage them to share your tracks with their peers to draw in more followers. Teaming up with other SoundCloud artists will expose you to their audiences and attract potential followers from them. Since this goes both ways, many artists are willing to collaborate with others on projects. This is why “featuring” tracks are popular on SoundCloud, and why they’ve been so popular in hop hop for decades. To make your collaborations successful, you need to have the right partners for the project. Look out for artists that have complementary styles to your music and create a good pitch for the project. You can also talk about what they can gain from teaming up with you. Letting your listeners download your tracks in exchange for following you on SoundCloud is a quick and effective way of encouraging listeners to follow. I couldn't wait any longer to share this new track with you. It will be out soon with Psychill Café but you can already download the mp3 file with the 'follow to download' option on soundcloud. There are many applications which can be used to create SoundCloud download gates. Many of these tools have various features to make your download gates enticing and shareable on social media. The kind of tracks that can be put up for download is the biggest factor in the success of these follow gates. Sharing SoundCloud-exclusive content is a good approach here. This could be a preview of a new track, or even the whole track itself, released for free. Be sure to post download gates on other social media platforms to attract additional traffic back to the SoundCloud page. Reaching out to places outside of SoundCloud will bring more listeners and potential followers. Aside from other social media site, music blogs and forums are good places to promote because of their large audience bases. Create interest for SoundCloud tracks and accounts can be as simple as included the link in the bio for the forum, or the comments of the music blog. Promoting offline is still an important aspect of music promotion, all it needs now it to include direction to a SoundCloud account. Reaching out to local/community radio stations is also easier as it’s easier to send a link to a SoundCloud account than it is to send a demo tape/CD. Attracting a large following on SoundCloud is by no means easy but the listed tips above will take much of the guesswork out of it. Be sure to check out our other guide on promoting your music on social media. This will definitely help any account gain more listeners, and make the current followers of the account more aware of the latest updates coming for any musician on SoundCloud.